SIRIM QAS International Sdn. Bhd. is Malaysia’s leading certification, inspection and testing body. 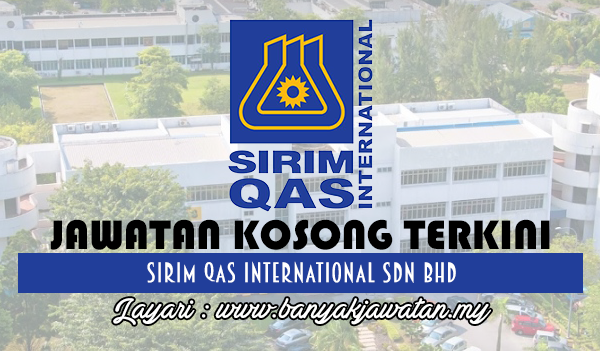 After over three decades of providing certification, inspection and testing services under SIRIM Berhad, SIRIM QAS International was established as a wholly-owned subsidiary of the SIRIM Group in March 1997. Today, local and international customers from a wide cross-section of the economy have made us the preferred choice for their certification, inspection and testing needs. Companies that wish to demonstrate their compliance with internationally recognized requirements have found their ideal solution in SIRIM QAS International's certification scheme. As a partner of the International Certification Network (IQNet), our management system certificates are widely recognized across the globe, adding value to your products and services and giving you access to world markets. Customers can also rely on our one-stop solutions and quality services to safeguard the interests of their customers and the environment. 0 Response to "Jawatan Kosong di SIRIM QAS International Sdn Bhd - 14 Jun 2018"